User registration and profile management can make your site engaging for the users around the globe. Today there is a number of such community sites that have attracted millions of people worldwide. Having such a large community of members surely adds value to your services and products. With such a growing number of users on a site, user registration and profile management become crucial for maintaining a website. Well-managed and properly maintained user registrations and profiles can help you build a large audience for your site. Whereas any kind of lag or negligence in this process may affect your site users. It ultimately costs you a loss of valuable customers, poor site traffic, and compromised services. Do you run such a website where the user registration and profile management strengthens your product and services? Then this piece definitely needs a thorough read. 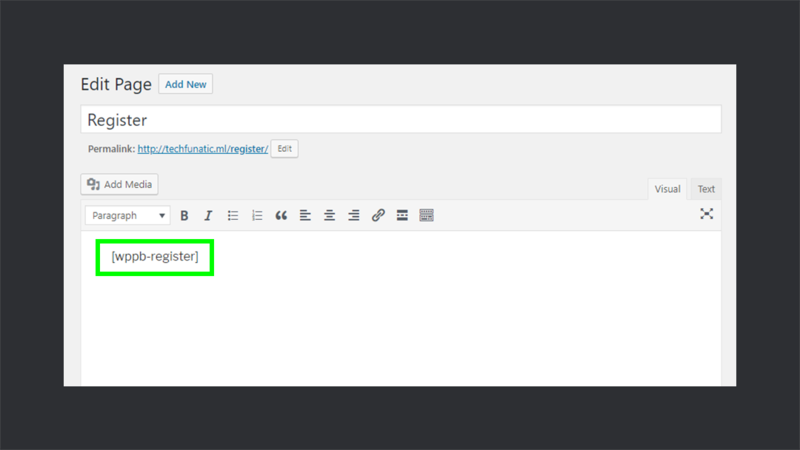 I just happened to find a very helpful WordPress plugin for you i.e., Profile Builder Pro. Profile Builder Pro is packed with tons of features and functionalities to boost your experience of user registration and profile management. Not only this but it also comes with GDPR compliance to make your site up to the latest standard regulations. I am super excited to introduce this plugin to you and share my experience with it. So let’s jump into it right away. 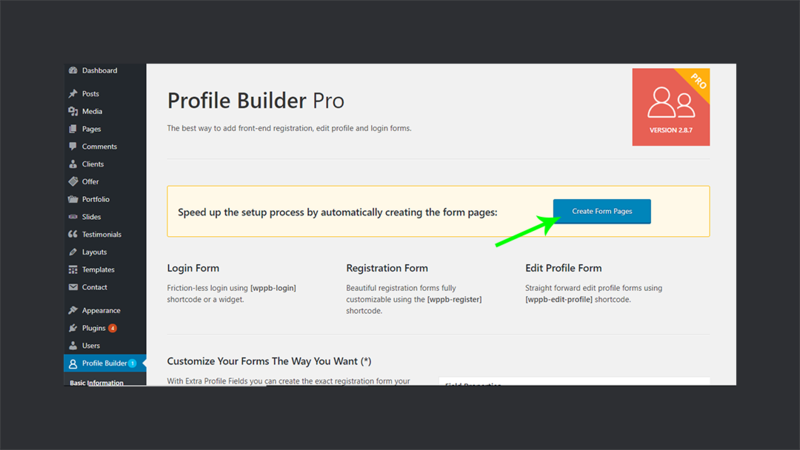 Profile Builder Pro gives you the power to create front-end registration, login and profile forms using quick and easy shortcodes. It is here because the default WordPress user registration and login are not so good for modern websites. That’s what Cozmoslabs say — the team behind this intuitive plugin. Cozmoslabs was pioneered by some brilliant minds – Adrian Spiac and Cristian Antohe. The company is primarily focused on providing premium and reliable WordPress plugins. These plugins help you to maintain your site in a very time saving and cost-effective way. Some time back we wrote an extensive review for one of their products i.e. TranslatePress. It helps you build your next multilingual site in minutes. It’d be great if you check out a detailed takeaway by the WPCouple team →. 👍Log in with email or username. ✅ Admin approval for new users. ✔ A support that gets things solved. 👆Drag & Drop to reorder profile fields. 📚Import/Export Users from and to CSV. 💬Translated in more than 25 languages. 📧Email confirmation for user registration. 💻 Control over the admin bar on the front-end. 🔞Enforce minimum password length and strength. ➕Extra profile fields for registration and edit profile. 🉂 Shortcodes for front-end login, registration, edit-profile & password reset forms. With these tons of features, you can enhance your experience of WordPress User Registration and Profile management. So let’s get started to explore this rich featured and super dope plugin. Cozmoslabs offers a straightforward and clear pricing for its products. You can get Profile Builder Pro in one of the two versions – Hobbyist or Pro Version. So head over to the Cozmoslabs website and purchase a suitable version for your site. A free version of Profile Builder is also available at WordPress repository. It provides you with the basic features for user registration and profile management. Its current version is 2.8.8 that rocks 50,000+ active installations with a rating of 4.5 stars. Login to your Cozmoslabs Account and download the plugin. 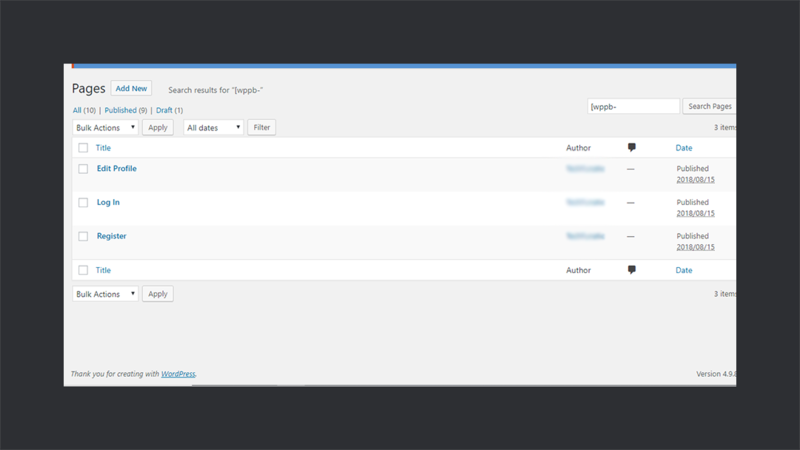 Head over to the dashboard of your WordPress site and navigate to the Plugins > Add New. Hit the Upload Plugin option. Now choose the zip file of the downloaded plugin and click Install Now. Activate the plugin right after the installation completes. Make sure you have checked the Anyone can register option from Settings > General. It will allow the users to register on your site. Once the plugin has been activated, you will find that a new menu called Profile Builder appears in the left sidebar of the dashboard. Head over to it. This will open up the Basic Information screen of the Profile Builder Pro. At the upper right corner of this screen, you can see an option Create Form Pages. It allows you to automatically create the default form pages for registration, login and edit profile with just a single click! After clicking this option, you can see the automatically generated form pages under the Pages menu. 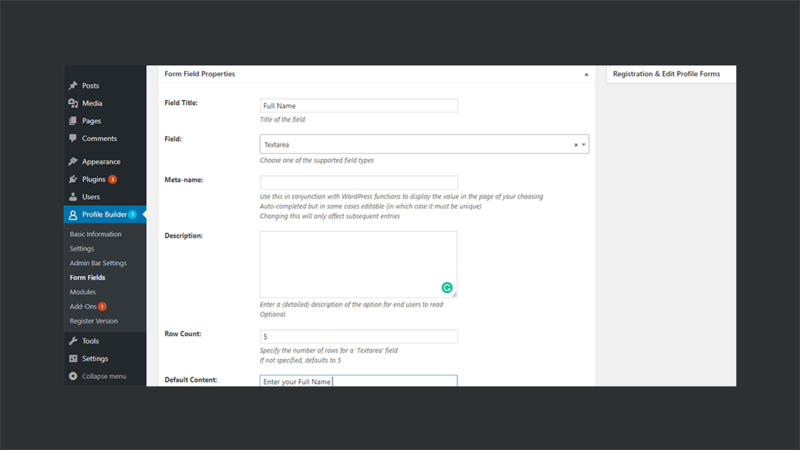 Once you have created the form pages, you can easily customize forms using shortcodes and publish them on your site. 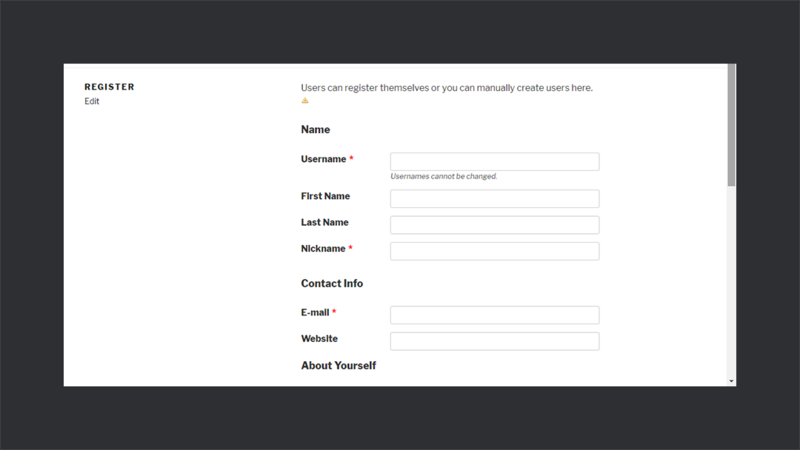 Let’s consider the Register form page to play around with this plugin. Navigate to the Pages menu and click on the Edit option under the Register page. This will open the Register page in Edit mode. Here you can see that there is nothing in the editor other than a simple shortcode for the registration form. If you Preview this page, you will see that this shortcode accounts for generating a complete registration form at the front end. 🚪 [wppb-login]: Shows front-end login form. 👋 [wppb-logout]: Shows front-end logout text and link. ✍️ [wppb-edit-profile]: Shows front-end edit profile form. 🔬 [wppb-recover-password]: Adds a front-end recover password form. 📊 [wppb-list-users]: Shows front-end user listing if the User Listing module is activated. Default: These are the pre-built fields that come with Profile Builder. Standard: It includes standard fields like textarea, avatar, checkbox, etc. Advanced: Here you can find advanced fields like reCAPTCHA and validations for security. Besides this, you can get fields for selecting country, currency, time zone etc. GDPR Checkbox: This adds a checkbox to get consent from the user for the collection of data under the latest GDPR laws. To add any field, select it from the Field drop-down menu. Provide the required information and hit Add Field button. Edit and Delete options are located next to each field. You can use them to edit any field or to remove it from your form. You can drag and drop the field to change its order. Hover over the field index and hold the field to drag it to the position where you want to place it. 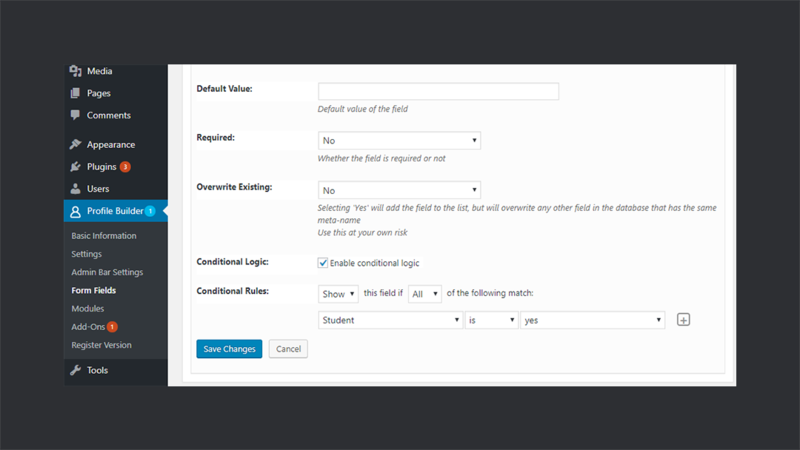 Conditional logic allows you to hide or show specific fields depending upon the user input. You can add conditional logic while adding a new field or by editing the existing one. For example, I applied conditional logic to a field named Institute in my form that shows up only if the user has marked itself as a student. So there’s pretty much you can achieve out of these forms. Let’s take a look at how you can further enhance your user registration and management with the Profile Builder Pro. 🏗 Multiple Registration Forms: It allows you to have numerous registration forms having different fields for the specific users. 🤹‍♂️ Multiple Edit Profile Forms: It gives the ability to different user roles to modify their specified profile information. 🈯️ User Listing: Allows you to create various user listings for the users at the front end of your site. 📩 Email Customizer: It enables you to customize the emails sent to the users or the administrator of a site on specific events. ↪️ Custom Redirects: You can redirect different users to different links based on individual user, user role or you can globally redirect all the users to a general link. Redirects usually take place after actions like login, logout, registration, etc. 🔄 Repeater Fields: This allows the user to duplicate the set of fields or remove them at the front end of a site. 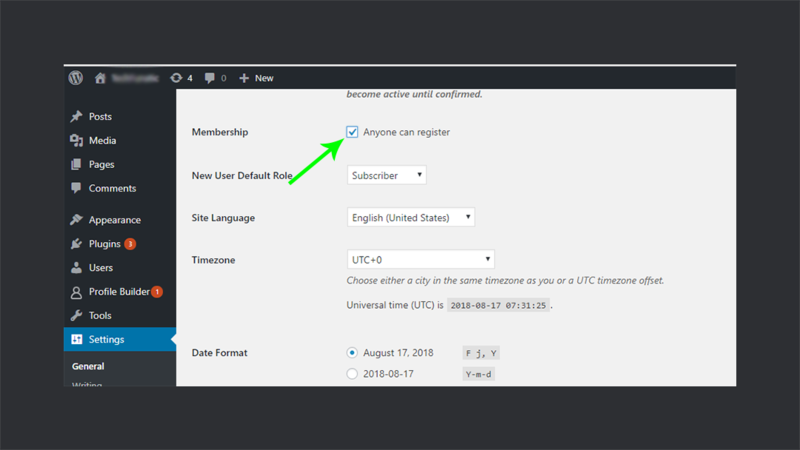 If you want to add paid membership or accounts to your site, then you can do it using an additional plugin by Cozmoslabs i.e. Paid Member Subscriptions. This plugin is fully compatible with Profile Builder Pro. To integrate it in your site, navigate to the Profile Builder > Basic Information. If you scroll down this screen, you’ll see a quick guide to the paid user profiles. 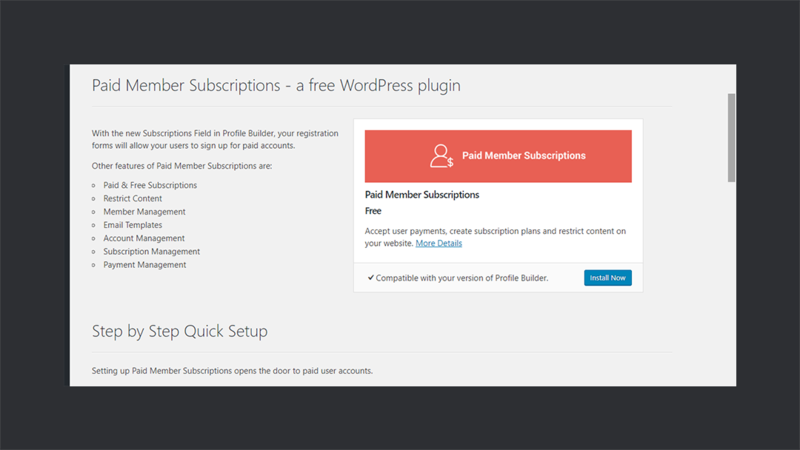 This guide introduces the Paid Member Subscription plugin and provides you with a step by step instructions for its setup. Profile Builder Pro is packed with tons of add-ons and supports cross compatibility with numerous other plugins. You can get them from Add-Ons option within the Profile Builder Menu. Just for the demo purpose, I decided to test one of their add-ons and it was for the WooCommerce. This add-on is at the top of the list as it adds value to your online store or business. Using this add-on, you can integrate the WooCommerce fields holding shipping and billing details to the register and edit profile form of Profile Builder. In this way, you can align users data in a single place. It makes user profile management real quick and easy. You can check out a comprehensive guide to get started with this add-on created by Adrian Spiac. If you get any query or issue with this plugin, then the best way to get it resolved is to look for it in the Profile Builder Pro documentation. I am sure you’ll get it fixed from here, if not then it’s time to reach their active and kind support. You’ll never need to worry about getting in trouble with Profile Builder Pro. They are here to help you fix all your issues and queries about this plugin. Profile Builder Pro is an all-in-one user registration and profile management plugin. It is stuffed with powerful features like shortcodes for forms, custom form fields, GDPR compliance, custom redirects, user listings, spam protection, customized emails and much more! 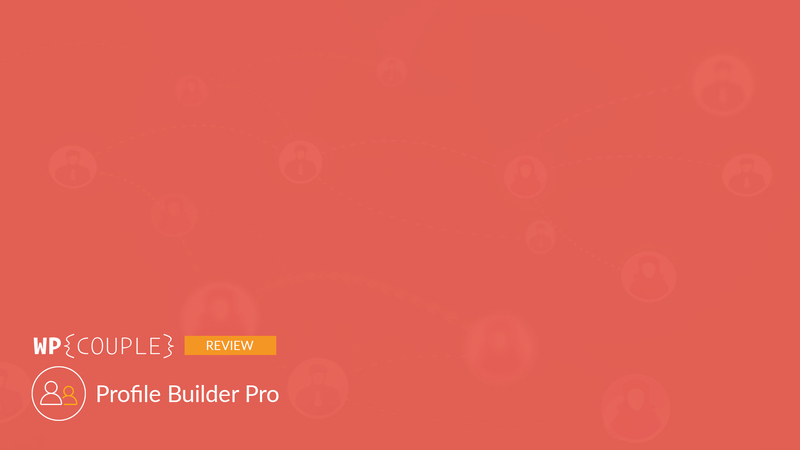 Profile Builder Pro provides you with tons of add-ons to boost up user management. Proper and well-managed documentation surely adds value to your product. Documentation of Profile Builder Pro has helped me a bit to get acquainted with this plugin. However, the current documentation is for Profile Builder v2.0, that’s quite outdated and the team should update it. Profile Builder Pro has now evolved to v2.8.7 and has incorporated many changes since then. So, my recommendation as an end user is to update the documentation to the latest version of the product. It would be great if this documentation includes some video guides as well. It will create ease for the beginners to get started with this plugin.